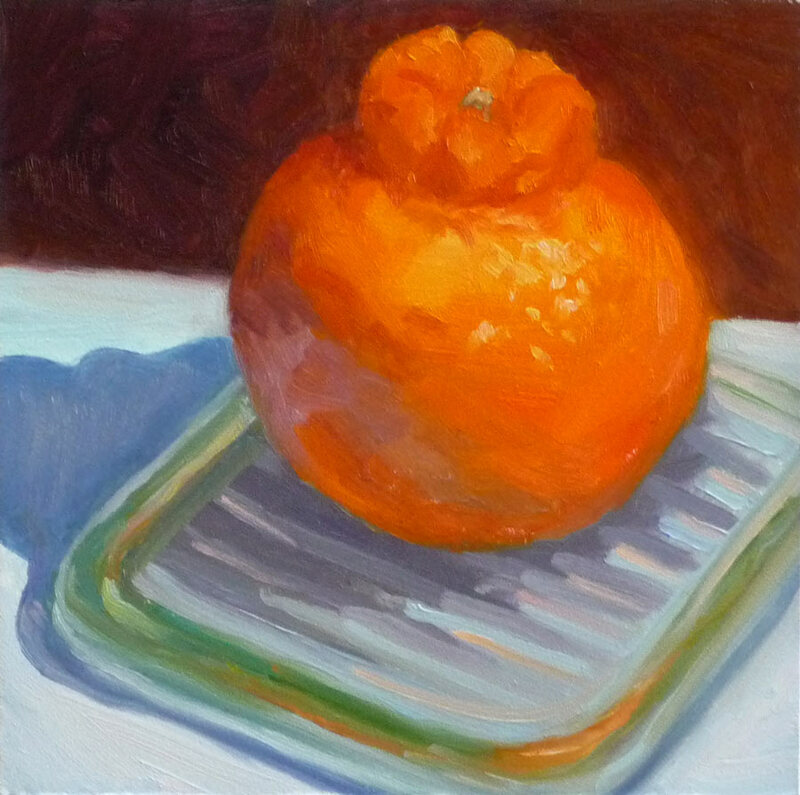 No, the injury and insult referred to in the title of this post does not refer to this painting of a Tangelo. It explains why I haven’t posted lately. First I had the stomach flu (or was it food poisoning from the dreaded peanut/salmonella scare?) The next week while waiting at the doctor’s for my flu shot, I felt a little tickle in my throat and wondered if I might be getting a cold. I was. It wasn’t terrible, and went to work all week. When the weekend arrived I expected to feel better and get to paint. But the cold (or was it the flu?) hit full force. For the next 5 days it hurt to think, let alone do anything creative. On day 10 my doctor prescribed antibiotics and I began to recover. That Friday night after a 10-hour work day, my cat Fiona begged me to come play tag with her. She loves to run through the house chasing me, and me, her. My house is perfect for this game because it’s quite long. It was originally two flats, mirror images, that I connected with a doorway, so it’s a nice long run. We look completely ridiculous, but it gets us both a bit of exercise. We’ve tried to teach Busby, my other cat, to play, but he doesn’t get it. He comes out of the closet that he’s been sleeping in to watch us, with a confused look on his face. So there I was running after Fiona when I felt a “snap” in my calf and then a sharp pain that made it nearly impossible to walk, except with a sort of peg-leg gait. When I called the advice nurse he ruled out all the really bad possibilities (broken things, torn apart things, blood clots, etc.) so apparently it’s just going to take some time to heal. It’s been four days and I’m still limping (and coughing). Despite the limp I was determined to paint this weekend, and chose a delicious Minneola tangelo sitting on the lid of a glass refrigerator container. I liked its funny little poofy crown. I learned that Minneola is both a city in New York and a combination of a Duncan grapefruit and a Dancy tangerine. I wish I could push rewind and go back one stage on this painting. Knowing when to stop is one of the hardest things in painting. You poor thing – you have all my best wishes for you to get better soon! So good to see you back, if not “up and running”. I was wondering where you had dropped off to. Love the Mineola and wish I had one now. I’ll have to settle for a mango. Take care of yourself! Oh my goodness, you have been suffering. I hope you feel much better very soon. This is absolutely super, it’s amazing to produce something so wonderful when you feel less than wonderful yourself! I’m so sorry! I hope you recover soon! That glass refrigerator lid — is that pyrex? It’s lovely and old fashioned, perfect with the tangelo. Here’s wishing you a speedy recovery. i also have a cat who loves to play tag. It’s lots of fun, but I wonder how it looks to someone from the Humane Society! I love the luscious colors of the tangelo. I am glad to see your beautiful painting as I was starting to worry a little about you. Now that I know you are recovering and chasing your cat I can relax, Oh, except now you are limping. Glad that is not stopping you from painting. This tangelo is so evocative to me of cozy winter California evenings especially with the lighting and the warm background color. Rewind our life, make different decisions. Now wouldn’t that be good. You wouldn’thave run through the house, wouldn’t have eaten dodgy food, etc. etc. Oh my, if we had known then what we know now, wouldn’t we have done things better! I have been thinking about the word ‘regret’ lately, but then that is a useless exercise isn’t it! Anyway, a bit of colour and paint surely cheers us all up! Hmmm…playing paper soccer with a couple of boisterous cats can also be fraught with danger. Get well soon, Jana. Sorry about your injury. My husband had one like it, but worse–he was a while getting past it. Jana, this is a good texture to the surface of the fruit. Can anybody help me with a problem in oil paint? I am painting a portrait of an ash-blonde little boy, though I am used to painting more brunettes. The fine guidelines on the face, a brown that sinks in nicely to brunette coloring, tends to stand out, giving a maskish quality. Also, the complexion seems flat (flatter than usual). Are there any tips? Sorry for all the pain you’ve had, and glad to hear you back. Don’t try to over do it though. Love your tangelo. I see all these oil paintings, makes me think about trying some oils. Thanks everyone. I’m feeling much better, and looking forward to getting back to painting this weekend! Oh no, Jana! Sounds like you had an awful week. Here’s hoping your stomach and your leg are improving quickly. The tangelo looks luscious to me. This tangelo really glows. I really like the colored reflections in the glass. I’ve always liked green and orange compositions. Sorry about your leg. As I recall from my landscaping days, it takes about 6 weeks for a muscle to completely heal so, no tag for a while. Exceptionally good tangelo painting, Jana. I got distracted about your illness followed by injury but in the end I hardened my heart and thought – if you can paint a tangelo that well you have to suffer a little 😉 The glass lid reminds me of the butter container we had when I was a child. Lovely. Okay, now I’ll be sympathetic and hope you have fully recovered. that you could tell that it was glass, and that kind of glass in particular.